NCLC’s publication, Student Loan Law, is especially useful for attorneys and advocates representing student loan borrowers. 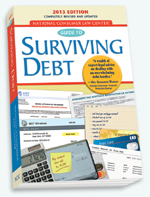 NCLC also publishes a book for consumers and their advocates, Guide to Surviving Debt that includes general information about handling all types of debts, including student loan debt. You can find advocacy-related materials, including reports, testimony, press releases, comments, and letters on the NCLC web site. The Department of Education publishes some useful guides and brochures. These publications are generally updated each year and are available in English and often in Spanish. The Department has a number of service centers available to help answer borrower questions. There is also a very useful and interesting Federal Student Aid on-line data center as well as FAQs for consumer advocates and counselors, mainly on servicing and collection issues. There is a separate section of the Department’s web site on servicing and collections.